The experiments trying to crack physics’ ‘biggest’ question: what is dark energy? We live in interesting times. For thousands of years, we have thought we knew what the universe – and everything in it – was made of: normal matter, the kind that make up the elements of the periodic table. However, the discovery in the 1990s of a completely unknown force dubbed dark energy that makes up 70% of the cosmos – causing it to expand at an accelerated rate – has taught us to be humble. Since then, astronomers have begun investing billions of pounds in experiments which aim to find out what this mysterious phenomenon is. What they discover is guaranteed to change physics forever. From the mountaintops of Chile and Hawaii, several telescopes have so far been retro-fitted with new cameras that are beginning to make maps of large areas of the sky. The Kilo Degree Survey, the Dark Energy Survey, and the HyperSuprimeCam Survey are all mapping about 10% of the sky in visible light. The idea is to look at how galaxies and other structures are clustered across the sky. One way to do this is to measure “weak lensing”, an effect where the light from distant galaxies is distorted by matter on its way to us, which unveils the scaffolding of matter in the universe. Dark energy has an impact on this because it stops the matter clumping together, which pushes everything apart. This can also be measured by looking at spectra, which separates starlight into its constituent wavelengths much like a prism does with sunlight, from galaxies. Another measurement technique is based on tracking supernovae, bright flashes of light that we observe when massive stars die. Because the physics of stars is relatively well understood, the amount of light that is emitted can be determined very accurately. Therefore by measuring the brightness of supernovae their distances can be measured, helping us track how they move as a result of the expansion of the universe. Composite image of the cluster of galaxies by the Dark Energy Survey. Bright points with horizontal white lines are stars in our own galaxy. Each of these experiments plans to make their first results known soon. However they are not purpose-built dark energy explorers. To get the most reliable results, astronomers have gone back to the drawing board and created more powerful – and much, much more expensive – experiments with bigger cameras that can map larger parts of the sky. One of these is Euclid, a new satellite that is being built by the European Space Agency. Due to launch in 2020, over only five years it will fundamentally change our view of the sky by taking high-resolution images, much like the Hubble space telescope did for a small patch of sky. 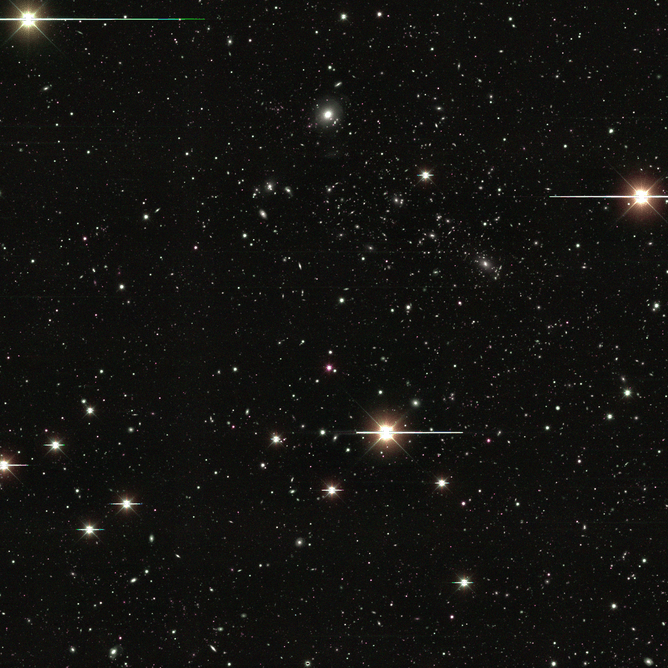 Euclid will use both the weak lensing and galaxy clustering approaches to map half the sky. Over in Chile, the eight-metre Large Synoptic Survey Telescope(LSST) is under construction. It too aims to map half the sky, but from the ground. Compared to Euclid, that will make a single very high-resolution image of the sky, LSST will make lower resolution pictures (blurred by the atmosphere). However its unique aspect is that it will create a movie of the sky by taking many hundreds of pictures over a decade, making it a powerful tool for detecting supernovae. Meanwhile, the Square Kilometer Array(SKA) will observe the sky in radio wavelengths through a network of radio dishes, which can be spread hundreds of kilometres apart. The SKA will network together radio dishes from the Sahara to South Africa, and across Australia, creating a single continent-sized telescope. In 2010, a decade-long US strategy for astronomy proposed to combine a dark energy experiment and an exoplanet telescope into one. The concept that was born was called WFIRST – a space telescope scanning for near-infrared waves. In 2012 the US National Reconnaissance Office offered to donate two unused “spy satellites”, the same size as the Hubble Space Telescope but with a wider field of view. One of these satellites now forms the core of the experiment, expected to launch in the mid-2020s. While each of these telescopes will work in isolation, cosmologists are realising they’ll achieve more by combining the information from all of them. Because they are very different, problematic effects such as those caused by instrument defects, can be removed by comparing the results. In fact, we are creating single super telescope for humanity. • Energy of the vacuum. Some believe that dark energy is simply a constant sea of energy at some particular value that fills space. But if this is the case, why does it have the particular value we observe rather than something else? After all if it were just a little bit higher the universe would blow apart. Failing to find a “natural explanation” for why the universe is so fine-tuned for intelligent life, some cosmologists resort to the Anthropic Principle, which states that the universe has this unlikely energy because if it didn’t, we wouldn’t be here to discuss it. But perhaps it is just part of a multiverse of parallel universes where the vacuum energy can be different in each? • Dark energy is like an anti-gravity. This works to push the universe apart. By tweaking Einstein’s theory of gravity, or by creating brand new theories of gravity, cosmologists have found that dark energy could indicate that our understanding of gravity is wrong. Gravity attracts, but maybe it’s repulsive on cosmic scales. • A new Higgs-like field. Cosmologists were very happy when the Higgs boson was discovered, partly because it’s a manifestation of a “Higgs field” – the first fundamental “scalar field” observed in nature. A scalar field is one that has a value at every point in space-time but no direction. An everyday example might be a pressure map on a weather forecast (values everywhere but no direction). A wind map, on the other hand, isn’t a scalar field as it has speed and overall direction. Apart from Higgs, all particles in nature are associated with “quantum fields” that are like the analogy of wind maps. It has been theorised that, like Higgs, dark energy could be another example of a scalar field. Of course all of these explanations may be wrong, dark energy could be something even stranger. But thanks to the efforts being put in over next decade, it seems we are close to finding out.